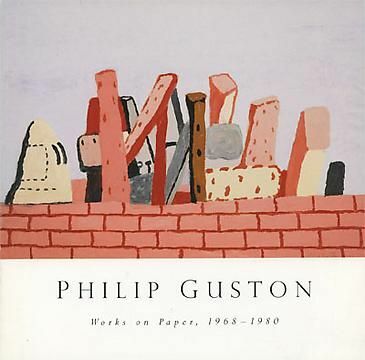 Philip Guston began his career as a figurative painter in the 1930s and 1940s, working at times for the WPA. He was soon swept up into the current of abstract expressionism, however, and his work from the following two decades was primarily non-objective. This exhibition focused on the drawings that he executed between 1968 and 1980 in which he revisited the figurative vocabulary of symbols and idioms of his work from the '30s and '40s. Throughout Guston's fifty-year artistic career he worked in "cycles," continuously reinventing his style. He often used drawings as sounding boards to work out ideas, images and compositions. The pure nature of drawing and the immediacy of the medium made it the perfect vehicle to explore and develop his thoughts "without the distraction of color and mass." Recurring images in these late drawings include nail-studded shoes, books, clocks, ropes and the hooded figure that first appeared in the 1930 drawing for Conspirators. In the mid 1970s, Guston removed the figure's hood to reveal a bloated, one-eyed head, often smoking cigarettes and surrounded by studio detritus. These self referential works reflected Guston's growing struggles with age and sickness, which were to plague him until his death.